Which Doorway Pull Up Bar Is The Best? Why go with a doorway pull up bar? There are tons of pieces of exercise equipment on the market. Simply put, it’s because a pull/chin up bar is a very cheap investment and allows you to do great workouts. It's good for a variety of upper body exercises, and very handy. And while not as good as starting with a basic weight training plan, you can still make great progress. Here's some more info so you can get one the works for you. Because there are a lot of crappy ones on the market right now. A non-secured doorway pull up bar is great. It's convenient (right in your own house), a great upper body exercise, and very versatile. My favorites are the Iron Gym Total Upper Body Workout Bar or the ProSource Heavy-Duty Easy Gym Doorway Chin-Up/Pull-Up Bar. Both of these are easy to stick up in a doorway without damaging the house, and you can find them easily enough on Amazon.com for $20 ~ $35. The expandable pull up bars don't stay in your doorway very well. You usually have to drill small holes in the doorjamb to make it snug, like I did for the one above. Also, the expandable pull up bar is only the bar. No fun pieces jutting out to give you alternate grip positions. In a nutshell, stick to the kind of pull up bar you see in the first photos. Those are easy to put up and take down, and to use for a variety of exercises -- and they don't damage your house. Pull ups are a great exercise. They're convenient and build real upper body strength. Also, you can easily work them into your routine. 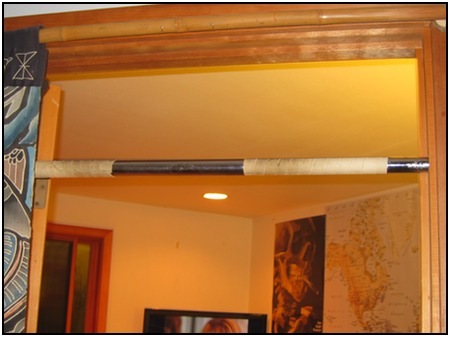 For example, put your doorway pull up bar in your bathroom doorway and do a few every time you go in. This can build some surprising arm strength pretty quickly. And if regular pull ups get too easy, you can always put on a backpack. You can easily increase (or decrease) the intensity of your exercise with weights and/or chairs and/or fanny packs. Plus, it's pretty cheap. The more expensive ones are around $30, which is really good when you think about it, and you don't need to get one that's squeaky clean from the factory. The ones from Amazon.com are very nice, but you don't need a really nice pull up bar. In fact, just about any horizontal bar will do. Look around your area on a Saturday morning. I bet you can find a garage sale with a doorway pull up bar - it's not like they're that specialized. I got my nicer doorway pull up bar at a rummage sale. If you have a play structure near your house, you don't even need to buy a bar. I lived in an apartment complex once with a play structure, and I could go out in the morning and walk not 30 seconds to do my pull ups. Do pull ups on tree limbs. Cheap and very simple. If you have a friend who's into exercise, check with them. They might lend you one to try out, or sell you one cheap. CraigsList and eBay are both great places to find a pull up bar for cheap. You can probably buy them for much less than retail, and if it's CraigsList then you can probably drive over and pick it up today. 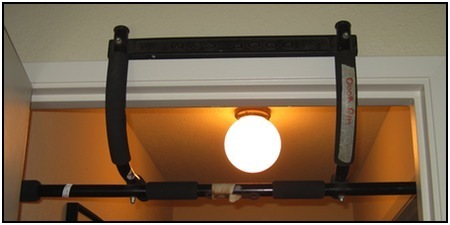 Is A Doorway Pull Up Bar For You? Maybe. They're ludicrously simple to get, safe to use, and very cheap. And you can do a ton of upper body exercises with them! If you don't want to do weight training, I recommend you try a pull up bar out. • Click HERE to learn more about Body Weight Exercises! • Click here to leave 'Which Doorway Pull Up Bar Is The Best?' & go back to the Home-page!